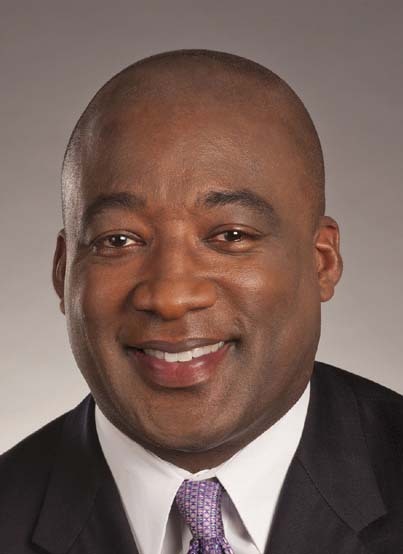 Michael Ford, the Chief Executive Officer of the Ann Arbor Transportation Authority, has been heard on more than one occasion to refer to the transit picture in Ann Arbor as the “Ball of Confusion”. He had a good point. Trying to describe the very complex plan, its parts, and most of all the policy issues surrounding each one of those parts as well as the whole is perhaps just slightly easier than explaining the importance of the Higgs boson. Much of the discussion about the TMP, especially including the numerous public meetings held to explain the TMP (especially in the District Advisory Committees), has been about the expanded bus system that is being proposed. But the TMP, and the implications of this new authority, go far beyond the bus system. As noted earlier, there are many moving parts. This post is intended to be a summary of the different projects and processes that are tied in to this plan. First, let’s define the term. What is transit? It is a shortened form of the term “mass transit” and implies some means to move groups and populations of people by vehicles designed for that purpose. So subways, buses, commuter trains, trolleys, monorails are all “mass transit”. Bicycles and walkways are not, though they join transit in the category of “alternative transportation”. Nor, in my opinion, are long-distance trains and buses. (They are simply a mode of transportation, like cars and airplanes.) Mass transit consists of systems to move large numbers of people without resort to the automobile. It is most common, and effective, in heavily populated areas. In fact, transit and residential density go hand in hand, since a certain population density is necessary to support transit systems, and transit systems make a high population density possible. One of the consequences of current fashions in urban planning is that Transit has been enthroned as an absolute good, an abstract ideal akin to Truth and Beauty. Thus, it has become a politically iconic term. In the recent 5th ward council primary, the word came back to me that I was seen as Against Transit. Nay, dear reader. I am a long-term lover and user of transit. My greatest experience was using the London Underground and I’ve been a bus and train commuter. But we need to keep a couple of things in mind about Transit. 2. There are a lot of important details around a successful transit system. They begin and end with funding (how is it to be supported?) and then are filled out by engineering, safety, passenger acceptance, route management, fares, and business operation. Details matter. Another factor is that different governmental jurisdictions are often involved and considerable cooperation and coordination is needed. For example, the Michigan Department of Transportation (MDOT) owns many major highways and is a major funding source for transit. Regional systems obviously involve many units of government. Thus, in discussing changes to Ann Arbor’s transit system, it is important to understand those details and how the moving parts affect one another. This post is intended as an overview of key issues or projects that affect the success of our transit system. Click on the cover to download the final 5-year plan. High-capacity routes from the TMP. Includes North-South connector and Washtenaw Connector. This work in progress is a “high-capacity” route from Plymouth Road to South State Street. Preliminary reports available here. The council has now postponed (until October 15) a discussion of a Memorandum of Understanding by which the city would join AATA and the University of Michigan in accepting a Federal grant (which requires a monetary donation for the matching fund) to continue the study (see report by the Ann Arbor Chronicle). This is a first step for the “North-South Connector”, part of the 30-year plan for the TMP. “High-capacity” implies an advanced technology like light rail, monorail, gondolas, or (lower tech) Bus Rapid Transit. See our earlier post on a UM symposium that explains different modes. A major purpose behind this connector is to carry high volumes of traffic between the various UM campuses. This is a coalition of different governmental entities that has an ultimate aim in the formation of a Corridor Improvement Authority, which would permit the CIA to collect tax from parts of four jurisdictions (Ann Arbor, Pittsfield Township, Ypsilanti City and Ypsilanti Township) on a tax-increment basis, similar to a DDA. Currently the extent of this project is from the join of Washtenaw and Stadium in Ann Arbor to the water tower (EMU campus) in Ypsilanti, but the 30-year vision is from the intersection of Wagner and Jackson to Golfside. 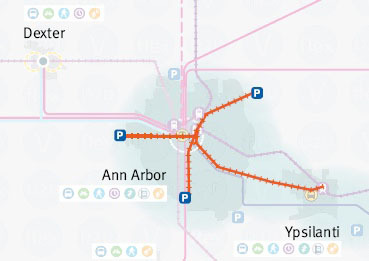 The Washtenaw Connector would ultimately be another high-capacity line. The group has been funded by part of a sustainability grant awarded to Washtenaw County (see our post) and recently awarded a contract to SmithGroup JJR (Concentrate story based on press release here). A major complication to the vision of a countywide transit system has been Mayor John Hieftje’s preoccupation with commuter rail. As we have written, trains have a strong attraction to the psyche of most of us who grew up in the 20th century. Two commuter rail systems have been grafted onto the TMP, though they are more about travel to other counties than within Washtenaw County. One is the commuter train from Ann Arbor to Detroit, sometimes called the “East-West train”. This appears to be dead in the water for the time being. The other is the WALLY, a train proposed between Ann Arbor and Howell (with NO stops in Brighton). There is no foreseeable funding for this line, though there was recently a grant award to design stations. These two lines were specifically excluded from the funding picture by the FTF and are not included in the current calculations of cost. But they have a zombie-like tendency to hang on, presumably because of the Mayor’s strong interest. They could still prove to present a financial challenge to the new authority. Note that the Amtrak line that uses the same tracks as the proposed East-West rail is in good shape. There is a concerted effort to bring the tracks up to speed (literally). An environmental impact statement for improvements to service is underway. See the MDOT site for more information. The Fuller Road Station was originally a joint project between the University of Michigan and the City of Ann Arbor whereby the UM would get a parking garage and Ann Arbor would get a “multi-modal station” that would eventually be a train station. The idea was that the E-W commuter rail would stop there and let lots of UM hospital workers off. It was controversial for several reasons, including the pre-emption of parkland (Fuller Park). This was thought to be in contradiction of the spirit of a charter amendment prohibiting sale of parkland without a vote of the people. There were many glitches in funding and timing and the UM finally pulled out. See the Ann Arbor Chronicle’s timeline for this long story. The grant is based on an 80% federal and 20% non-federal funding ratio. Matching funds are required in the amount is $701,600 per the overall planning project scope of $3.508M. Ultimately, the decision was made to go ahead and, as reported in the Ann Arbor Chronicle, a little over $300,000 from the General Fund was allocated to the project. (The city presented some prior work as payment in kind for part of the matching funds required.) SmithGroupJJR is currently working on an Environmental Assessment, a necessary step in any Federal granting process. A year ago, the Finance Task Force (a blue-ribbon committee of finance experts appointed by the AATA to put together a financial plan for the TMP and the new authority) was reeling with the discovery that Governor Rick Snyder had proposed a wholly new organizational entity and funding proposal for mass transit in the SE Michigan metro area. See our post with details of the bill package. As of today, it appears that there is not much movement on this large package of bills. But the AATA was told by transportation consultants last fall that Governor Snyder might wait for this year’s lame-duck session to push for their passage, so stay tuned. As we have discussed in the past, the level of service presented by the AATA is heavily dependent on Federal funding. There are two basic sources of Federal transportation funding: the gas tax trust fund (supported by the Federal fuel tax) and non-trust fund (i.e., discretionary) allocations. These have been administered for decades via a monster omnibus transportation bill. The name of the bill has changed a number of times, as has its provisions. Many provisions are favorite children of powerful interests, so debate on the bill is always very political. The last transportation bill, SAFETEA-LU, was extended many times and was near expiration once again through the early part of this year, causing a great deal of uncertainty in transportation planning. There were many tense moments, including the one in which a House committee took transit out of the trust fund. But finally, in a (very rare) burst of bipartisan, bicameral cooperation, a new transportation bill was signed into law this summer. It is MAP-21 (Moving Ahead for Progress in the 21st Century), signed into law July 6, 2012. The impact of the Federal law changes is already being felt in AATA budgets. As reported by AnnArbor.com and the Ann Arbor Chronicle, AATA just passed its FY 2013 budget with a deficit. This was caused partly by changes in the formula by which the State of Michigan provides operating funds to transit agencies (these operating funds are from a state gas tax fund as well as a pass-through of Federal funds) and partly by “advance implementation” of the TMP. AATA has implemented several items, including the AirRide service to the airport, express commuter routes, and the additional service to Ypsilanti via Route #4, that are really regional service and part of the TMP. One apparent offset is that Section 5307 (the main source of transit funding), which was not available in the past for operating funds. Note that transit funding comes in two very important categories, operating (daily operations) and capital (buying new buses, etc.). There are often very strong firewalls between these two categories. According to White, AATA will now be able to dip into Section 5307 funds (which have remained at approximately the same level) for operations. In other words, AATA will be borrowing from its source of capital funds in order to implement the TMP. For FY2013, staff is proposing to use $1,474,000 in Section 5307 funds for operating assistance. 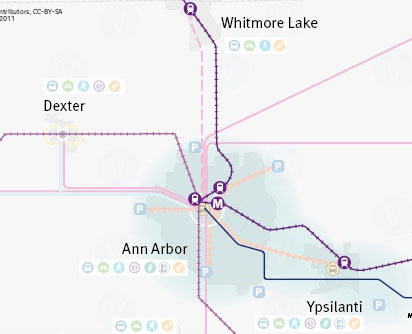 The purpose is to help fund the cost of the advance initiatives of the 5-Year Transit Plan of the TMP, including additional service on the #4 Washtenaw route, Night Ride expansion, and AirRide service. This use of 5307 funds would reduce the balance at the end of FY 2013 to $2,244,089. But it appears that the initiatives are not the only thing advanced here. The AATA is also (apparently) claiming the larger region as its area, not just the City of Ann Arbor. Of course, the City of Ann Arbor is only just over 100,000 in population. It is not clear how this expansion is justified. A possible source of change and uncertainty in area transit is the sequestration of Federal funds beginning in January 2013, if Congress does not come to an agreement on the budget. According to Transportation Issues Daily, non-trust fund programs are the ones to be cut. It will require some study to see which local programs will be affected if the country really does fall off that “budget cliff”. That is the overview. In future posts, we’ll try to get down to some details. UPDATE: Today’s article in the Ann Arbor Chronicle includes some important discussions. It explains at greater length the shortfall in the AATA’s budget due to MDOT formula changes. It also reveals that there is some discussion of the DDA taking up the City of Ann Arbor’s contribution to the connector study. SECOND UPDATE: Governor Snyder has published a new message regarding the Regional Transit Authority for Metro Detroit. He is citing a public hearing at the House Transportation Committee held last week. THIRD UPDATE: The AATA Board voted to file Articles of Incorporation to form an Act 196 authority at a special meeting on October 2, 2012. See coverage by the Ann Arbor Chronicle and AnnArbor.com. FIFTH UPDATE: An article by Ryan Stanton on AnnArbor.com states that Council will consider a new resolution on Monday, October 15, 2012, that will place the future construction of a train station on Fuller Park before the voters. But the resolution will also spend another half million of General Fund money on making whole the matching funds for the Federal grant. Turns out the FRA didn’t accept the creative accounting offered by the the city, by which the city’s prior expenditures might get counted as matching. SIXTH UPDATE: Some stunning reportage by Dave Askins of the Ann Arbor Chronicle indicates that the AATA board members currently serving will not be able to serve simultaneously on the Washtenaw Ride (name of new authority) board. Other political implications are also in the report. SEVENTH UPDATE: An article today (November 26, 2012) in AnnArbor.com summarizes progress and status of ReImagine Washtenaw. Note: A listing of related posts is on the Transportation Page. This entry was posted on September 30, 2012 at 1:13 pm and is filed under civic finance, Transportation. You can subscribe via RSS 2.0 feed to this post's comments. You can comment below, or link to this permanent URL from your own site.